#TasteUSA is a campaign created by Discover America, the country’s national tourism board, to celebrate the USA’s varied and delicious culinary landscape. As part of this wider campaign, five UK food and travel bloggers were invited to the US, and each one sent to a different corner of this vast country. I was lucky to have been one of these bloggers and even luckier to be assigned California as my host state. Readers of this blog and followers of my Instagram account @thelondonfoodie, will have seen the #TasteUSA hashtag as I discovered and reported the local foods and bustling neighbourhoods in my trip to California. Here, in The London Foodie, I write in a little more detail some of my foodie and travel adventures there. I travelled solo, hiring a car for a foodie road-trip that took me from north to south, the entire length of this American state. It was one of the most exhilarating experiences of my life, both exciting and frightening in equal measures - I would be lying if I said I was not apprehensive to be driving on my own, spending nearly 10 days talking to myself! These worries were unfounded though as I soon discovered how hospitable the American people are. The road and motorway infrastructure in the US is second to none and with cruise control, sat nav and low petrol cost, it made for a very pleasant drive! There is a huge contrast between Northern and Southern California, and they are almost like different countries in terms of food, landscape and climate. Landing in the northern part of the state in San Francisco, where I spent a couple of nights, I drove further north to the wine country of Napa, then down to the gorgeous seaside town of Monterey. From there I hit the road again via the super scenic Highway 1 that runs through the entire coast of California to the southern part of the state, Santa Monica, Los Angeles and San Diego. Using Highway 1 will add a few hours to your journey time, but the trip is an amazing experience in itself. In part 1 of this travelog, I recount some of my foodie and travel experiences in northern California – San Francisco, Napa and Monterey. Southern California - Santa Monica, Los Angeles and San Diego will be covered in part 2. One of the nicest things about visiting San Francisco is that, although the city is big in terms of cultural attractions and dining, it is geographically rather small – only 49 square miles (London is 607 square miles). It is also one of America’s most pedestrian-friendly cities making it easy enough to see and do a great number of things in a short period of time. This #TasteUSA feature is not an exhaustive list of things to do in San Francisco, but between one meal and another, there are some unmissable things I would recommend including a visit to the Golden Gate Bridge, to Alcatraz, and taking a cable car ride along the hilly streets of the city. Fisherman’s Wharf is a must for great seafood, and the Ferry Building at Embarcadero has become since its renovation the home to a large number of gourmet shops, restaurants and wine bars. One of my favourite places in San Francisco is Grant Avenue, the oldest street in SF, which runs through the heart of Chinatown with its many exotic food shops, temples and restaurants, and is a great place for a stroll. Next to Chinatown is North Beach, the city’s Italian quarter –a charming neighbourhood of pavement cafés, Italian pizzerias and quirky little shops in and around Washington Square and along Columbus and Grant Avenues. This is where we had a fantastic pizza lunch at Il Casaro, but more of that later. I stayed at the renowned Fairmont Hotel in San Francisco, at the very top of Nob Hill. One of the grandest hotels in the USA, the Fairmont Hotel is a member of the prestigious Historical Hotels of America collection. The Fairmont Hotel is huge with 597 rooms and suites, 3 restaurants, numerous rooms and corridors and all the other amenities expected of a top 5 star hotel. My room was comfortable and elegantly furnished with many original art deco features, and I had an enjoyable one-night stay there. The Fairmont Hotel is conveniently located a few blocks from Market Street, one of the busiest shopping streets of San Francisco in the heart of downtown. I thoroughly enjoyed my stay at the Fairmont Hotel, and recommend it to anyone visiting the city. Some of the fantastic restaurants in the city I got to try included State Bird Provisions, Il Casaro, Tosca Café and Hakkasan and I have written a separate blog post on “Where to Eat in San Francisco” which I will share in the next couple of days. A couple of hours drive north from San Francisco is the town of Napa. Together with Sonoma, these are the two best-known wine producing regions in Northern California. You might have seen the hilarious wine-themed film Sideways, and Napa is where it was shot. Napa town is small and charming, and merits at a few days’ exploration. Unsurprisingly, the major industry in town is the making and selling of wine, so it’s a great place to spend some time if you are a wine-lover. There are hundreds of wine shops in town, which is surrounded by more than 400 wineries, many of which offer tours and tastings and are worth a visit. The largest, most well known wineries such as Mondavi and Beaulieu are open daily with large hosting facilities and professionally guided tours. The many smaller wineries may offer tastings only by appointment. Most vineyards charge a small fee of around $10 per person for the tastings, especially at the more popular vineyards. 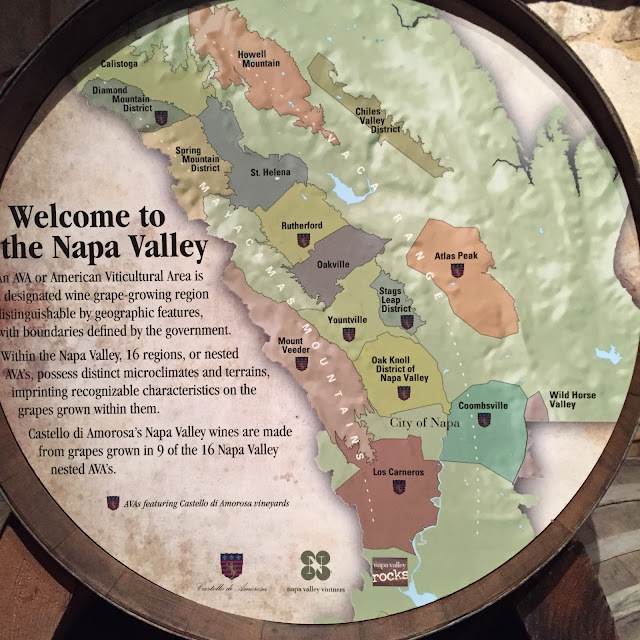 For more information on where to experience wine tours, and to find a list of wineries and wine shops in Napa, visit the Napa Visitors Centre. Back Room Wine Shop on Main St in Napa downtown has a great selection of local wines, as well as an extensive range from all over the world. I had a brief tasting here, sampling a few local wines, with the very knowledgeable and enthusiastic owner. My experience the world over has been that where good wine is produced, good food is sure to be found nearby, and Napa Valley is no exception. The valley is home to the prestigious Culinary Institute of America at Greystone in the town of St. Helena, which reinforces the tradition of excellence in the cuisine of the region and beyond. There are many excellent chefs in this area and many great restaurants. One place to be mentioned is the 3-Michelin starred French Laundry in Yountville. Reservations open two months in advance and sell out fast. Try if you must (sadly I didn’t), but there are many other delicious options. One of these options is Celadon where executive chef Marcos Uribe offers an eclectic selection of dishes from California and around the world referred to as ‘global cuisine’. I had a very good meal here starting with a delectable platter of deep-fried calamari in a light coating, served with a spicy chipotle chili, orange honey glaze, and Japanese pickled ginger. The pasta of the day was fresh fettuccine with a super slow-braised and melting-in-the-mouth beef short rib in a rich sauce with tomatoes, mushrooms and rocket. Next was Akaushi flat iron steak, grilled yukon gold potatoes, cucumber, blue cheese and salsa verde (a vibrant sauce made with green tomatoes, coriander and green jalapeno). This was also very good – great local ingredients expertly cooked. Just around the corner from the Napa River Inn, Grace’s Table is a bistro serving excellent American breakfast. On my visit, their house buttermilk pancakes with mixed berries and organic Vermont maple syrup were light and fluffy in a very generous portion. Noteworthy also was the Grace’s Table cornbread served with deliciously aromatic lavender honey butter. Oxbow Public Market, located in the Oxbow District of Napa, is a buzzing marketplace for artisan food and wine in Napa Valley, with a number of food vendors, cafes and an organic produce outlet for local farms. This is where many residents come to buy provisions, and meet friends for some wine, food and a chat. It’s a lively, vibrant place, and I spent an enjoyable couple of hours there. Next to Oxbow Public Market is Gott’s Roadside, a popular burger joint in Napa and San Francisco, where they have another branch in the Ferry Building. I had a delicious green chili cheeseburger ($10), spicy sweet potato fries ($4) and a reviving pint of Sierra Nevada ($6). A member of the Historical Hotels of America collection, the Napa River Inn is a charming hotel built on the premises of a 19th century mill. Situated in the bustling downtown Napa's Riverfront District, with beautiful views of the Napa River, the hotel is convenient for visits to the neighbourhood’s specialty shops, restaurants and wine merchants. My room had an olde worlde feel to it, with wood paneling, elegant furniture and a large, very comfortable bed. I had a great stay at the Napa River Inn, and I would recommend it to anyone visiting the valley. There are several routes to reach Monterey from San Francisco, most of which are along soulless and endless freeways. I took the lovely Highway 1 route, which added an extra couple of hours to the journey time, but afforded spectacular views of the Pacific coastline as it heads south to the town and beyond. Driving on Highway 1 was one of the highlights of my Californian adventure, and I can’t recommend it highly enough. 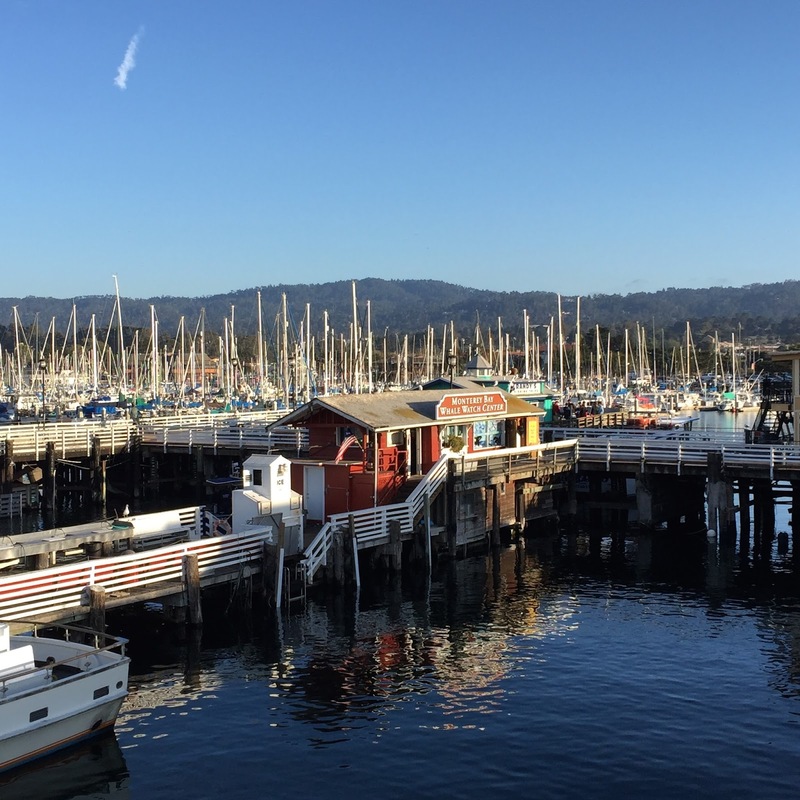 A small town with a population of just 28,000, Monterey makes for a great weekend trip for those staying in San Francisco. It was originally the state capital of California, and has many historic buildings in its town centre as a result. Today it is best known for its beautiful coastline, world-class aquarium and Monterey Jack cheese. The town has a busy farmer’s market, located at the Old Monterey Marketplace on Alvarado Street between Del Monte and Pearl. Here I spent some time sampling some local produce, chatting to farmers and food vendors. The ‘Roli Roti’ rotisserie chicken was by far the busiest food truck in the market, drawing a crowd to a seemingly never-ending queue. I could quite understand why, because whether sold whole or half, the chicken was succulent and flavoursome, and the roast potatoes served alongside had been cooked in the rich cooking juices that fell to the bottom of the rotisserie, to give crisp, crunchy and delicious roasties. And they were very good value at only $14.50 for a whole chicken, $7.50 for a half, and $3 for a small portion of potatoes. From the market, I paid a quick visit to Fisherman’s Wharf and Pier, then walked along the scenic costal pathway that led me to the busy and historic Cannery Row with its many shops and restaurants, and finally to Jeninni’s Kitchen and Wine Bar for my dinner. I had some of the best food of my Californian trip at Jeninni’s. Head chef Trevor Mathiaq’s cooking was punchy, vibrant and full of flavour. I loved his use of local ingredients partnered with a medley of Persian and Middle Eastern spices, and his re-interpretation of classic Mediterranean dishes Californian-style. Clams à la sidra came with lardons of Benton’s bacon (Alan Benton is reputedly the best bacon producer in the U.S.), as well as kale and chunky grilled sourdough bread ($16), and was a revelation. Better still was his crispy octopus, served with Calabrian chili and a delectable lemon marmalade that saw me scraping my plate ($16). I loved the aubergine fries, spiked with urfa pepper and honey aioli ($8). This was the first time I had tried aubergine fries (I love the courgette variety), and they were delicious. Equally good were the shawarma pork buns, served with pickled chili and pomegranate molasses ($11). I was glad to see this Taiwanese classic make its way to the coast of California and get a makeover. To finish, I sampled the local albacore tuna, grilled and served with radish slices on a bed of lentils, heirloom carrots and chermoula ($29). A hearty dish, the albacore was meaty, succulent and richly flavoured from the chermoula, and the accompaniments were wholesome and delicious. Jennini’s Kitchen and Wine Bar is a long way from the touristic restaurants of Monterey’s Fisherman’s Wharf and Cannery Row, and it is in a different culinary league. The restaurant was full but I think I was the only traveller there on the evening of my visit. I would very much recommend it to anyone visiting Monterey. For more information on the #TasteUSA campaign and Discover America, visit their website here. For a great Highway 1 driving-route from San Diego to San Francisco suggested by Visit California, visit their website here. If you have a little more time in San Francisco and are interested in getting to know this city inside out, I recommend a book called ‘Stairway Walks in San Francisco’ by Adah Bakalinsky, it is currently on its 8th edition (published in September 2014), and can be bought on Amazon here. When I first visited the city in 1995, I bought this book and spent two weeks discovering some of the hundreds of meandering stairways running along San Francisco’s 42 hills, many of which are unfamiliar to tourists and locals. Walking with this book was like having my own personal guide taking me to the greatest views of the city, sharing anecdotes about the city’s neighbourhoods, their architecture, history and culture as well as their restaurants and cafes along the way. I cannot recommend this book highly enough. A standard double-room cost from around £300, room rates vary according to room type and seasonality. Valet parking at the hotel costs a whopping $66 per night; so if you are driving to San Francisco and decide to stay at this hotel, do budget for this. I caught your blog recently and love it. As a 3rd generation Californian I love it when people speak , and write glowingly of my home state. I want to clear something up for you though as a proud so cal gal you should know Sideways was written about and filmed in Santa Barbara/ Santa Ynez wine country. I hope you got a chance to stop there!! !